RC today liked KC's chances of winning, as we figured Scott Elarton might keep the Royals in the game while the offense beat up on an experienced Tampa Bay starter. But the only beating dished out was by the D-Rays, who tied a club record with six home runs en route to an 8-2 victory. Elarton lasted only 4.2 innings, surrendering eight hits (including three home runs) and four earned runs. Elarton has now allowed four or more runs in six of his last seven starts, and he hasn't had a truly good outing since his May 5 start against the White Sox. In those seven starts, he's allowed a total of 12 home runs, after allowing seven in his first seven outings. Hopefully he'll turn it around, but today's start is probably the type of performance we should expect to see a lot more of throughout the season. The offense managed 10 hits but could only score two runs. In fact, in the ten games played thus far in June, the Royals have now scored two or fewer runs six times, losing all six games. But as bad as the offense continues to look, it's surprising to see that some players are having remarkably good months. Doug Mientikiewicz has led the way in June, posting a batting line of .429/.515/.500. Minky is 17-for-41 (.415) dating back to May 28, and he's raised his average in that time from .248 to .284. His still not an ideal three-hole hitter, but our complaints will be muffled a bit as long as he stays hot. David DeJesus has also played well this month after returning from the DL in late May, and his June line of .351/.467/.541 has raised his overall numbers to .280/.372/.467, which are very solid considering his slow start. Of course, maybe the best news of all is that Mark Teahen is starting to hit the ball. Since his recall on June 3, Teahen has four multi-hit games and has posted a line of .393/.433/.536 with a home run. He's pulling the ball better, and he's only struck out four times after going down on strikes 23 times in his first 23 games. His defense, however, has been somewhat lackluster, and 810 WHB today reported that the word around the clubhouse is that Teahen's right shoulder is completely shot. Teahen is reportedly playing through shoulder pain. He was scheduled for an MRI when he was in Omaha, but he's apparently decided to gut it out and play through the pain. Nevertheless, it's good to see Teahen continue the blistering offensive pace he started last month in triple-A. We just hope he's not doing additional damage to his shoulder. RC Correspondent Chris Ray today had an interesting question. It is well known that the Royals have followed the recent trend in baseball of having their top prospects skip triple-A on their way to the Majors. Across much of baseball, clubs now use their triple-A farm clubs to stockpile organizational types and aged veterans who can step into the big leagues for a short period to fill a hole if needed. Opinions on the wisdom of this change are mixed, but it's certainly the prevailing trend for an organization to house its best young prospects at double-A. New Royals GM Dayton Moore, however, comes from the Braves organization, which is one of the few remaining organizations that does it the old fashioned way. For example, when RC went to Richmond last year, we saw a triple-A ballclub stocked with young talent, such as Andy Marte, Chuck James, Anthony Lerew, and Tony Pena, Jr.
Ray wondered if Moore, who has promised to replicate the Braves' model for scouting and player development, has a change in store for the way the Royals utilize their Omaha affiliate. We have no idea, but it was an interesting question that we hadn't yet considered. It's definitely something to watch for, and it wouldn't surprise RC one bit to see Alex Gordon and Billy Butler make stops in Omaha before graduating to KC. Anyway, that's it for today. Stay tuned this week, as we should finally bring our promised draft analysis (barring another blogger meltdown). Up next, we plan to discuss some of the better collegiate pitchers who were drafted on Tuesday, as the Royals did a very nice job bringing in some quality arms. Scott Elarton = $9 million of mediocre to bad pitching. Thanks Allard. I too hope Dayton uses AAA to develop players. I'd like to see Alex Gordon move up to Omaha after the All-Star break, along with Mitch Maier. Its early, but I also like Dayton's strategy of picking up everyone off the scrap heap and giving them a tryout. You never know when you'll find another Joe Randa, Raul Ibanez, Paul Byrd or Jeff Suppan (all acquired for basically nothing after teams gave up on them). I tentatively plan to attend the wichita-tulsa game tonight. Tentative because 1)my wife was due with our first child yesterday, so the baby could come anytime 2) we're receiving light rain today in tulsa. Any chance Teahan moves to first next year. With Huber playing mostly left field in Omaha, Mark could move to first opening the third base spot for Gordon. I think it's doubtful, because it would take at least a couple of things to happen before such a switch would be made. First, Teahen would have to establish himself as a Major League hitter. Hopefully he's on his way, but the odds still probably aren't in his favor. Second, the Royals would have to decide that Gordon is a significantly better defensive 3B than Teahen. Since Gordon has experience at 1B, and has played very well there, the Royals at this point would seem far more likely to move him across the diamond, rather than teach Teahen an entirely new position that he may or may not take to. Went to the Wranglers game tonight, thru seven innings. Greinke looked really shaky tonight. He came out throwing strikes, and they watched a lot of pitches the first inning, no problems. Second inning, he got raked. Double off the fence to Ian Stewart, then a bomb from Koshansky (sp? 1B with 16 hr's on the year), who ended up hitting another bomb off Greinke a few innings later. Zack threw one curve the first 2 innings, and the wind knocked it down for an out at the wall. After the first HR, he threw 6 straight balls, and looked really pissed. This looked like the same thing as last outing, gave up some hits, then couldn't repeat his delivery. Pitching coach came out, and he immediately got out of the inning with much sharper stuff. He labored through the rest of the outing, some batters looking brilliant, but he was consistently hit very hard by most of the Tulsa lineup. The really noticeable thing, is he was getting ahead of many hitters 0-2, then getting absolutely hammered. He didn't seem to have the ability to finish off hitters? As for offense, Maier looks really hot at the plate right now. He's not really controlling his AB's, but jumps all over the first good pitch he sees (not working the count, still swinging at crappy pitches). He looks fast in center, and is really strong cutting off balls in the gap. He did let an easy fly drop in front of him. 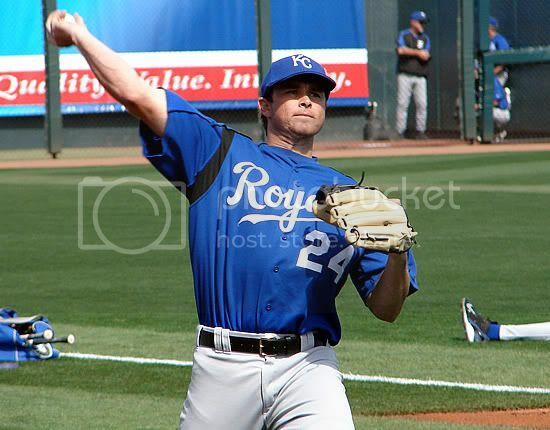 Almost looked like he was already in a Royals uniform? Gordon and Butler look so advanced at the plate, compared to the other hitters in the game. Lubanski looks God awful at the plate. He honestly looks like a pitcher trying to hit in the majors. All upper body and arms in his swing, with a little uppercut. He didn't have a clue facing 3 different pitchers. Balls or strikes, he swung away, and looked terrible. Granted this was only one game, but I'm sure his crappy swing didn't suddenly show up tonight? He is forever away from big league material, even for our royals. Butler is really bad in RF. Gordon looks like he's already been in the bigs for a few years. Amazing presence on the diamond. He's gonna be a freaking stud in the bigs. Royals hire Dean Taylor to be VP and Director of Baseball Operations. He was working with the Reds. He was Brewers GM from 1999-2002 and was an assistant under Schuerholz with the Braves. Looking at his GM record, I'm not impressed but perhaps he's better suited for an assistant role, like he was in Atlanta. Thanks for all of the minor league analysis everyone! Great reports. I'd like to see AAA Omaha used as a last preparation point for the Royals prospects. If teams are stockpiling "aged veterans" and "organizational types" in AAA that are ready to fill-in in the Bigs, then a few months there for every prospect should be almost mandatory. AAA is the only place in the minors where one can get experience against teams that are made up mostly of players with some type of ML experience. Does Dean Taylor replace anyone? Sorta. He's taking like half of Muzzy Jackson's responsibility. The way I understand it, Jackson is like the head administrator of the Royals, and Taylor is the head baseball man of the Royals, with both answering to Moore. The Final Countdown...Draft just hours away! Flash: Baird out, Moore in.